“If NMC is forced upon the fraternity, IMA will declare complete withdrawal of services by all modern medicine doctors throughout the country immediately,” – IMA President Dr Ravi Wankhedkar. 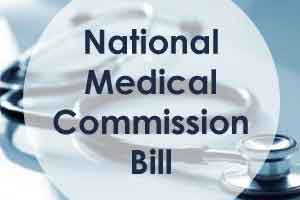 New Delhi: On Tuesday a three-hour meeting was held between the Indian Medical Association (IMA) and Union Health Minister J.P. Nadda regarding the National Medical Commission (NMC) Bill 2017. After the meeting, the association called the discussion “inconclusive” even while reiterating its warning of an indefinite strike. IANS reports about the meeting in which the IMA President Dr Ravi Wankhedkar demanded government regulated fee for 85 percent of the private medical seats as meritorious students from lower socio-economic strata would not be able to pursue medical education if the present 50 per cent quota of the private management is allowed. The Union Minister discussed the various other demands of the IMA which include amendment in Pre-Conception and Pre-Natal Diagnostic Techniques (PCPNDT) Act, capping of compensation in Consumer Protection Act, enacting the central law against hospital violence and amendments in Clinical Establishment Act. Calling the present form of the NMC Bill 2017 as unacceptable Wankhedkar told the Minister that the association would take direct action if the desired changes are not made. “If NMC is forced upon the fraternity, IMA will declare complete withdrawal of services by all modern medicine doctors throughout the country immediately,” Wankhedkar added while reiterating the IMA’s stand. However, he further thanked the government for dropping separate licentiate exam, agreeing to the IMA suggestion of common final year examination and for the punitive clause against quackery. As per the media report, the IMA is against allowing AYUSH doctors to prescribe allopathic medicines. Medical Dialogues earlier reported about the stir called by the Indian Medical Association (IMA) that was held for two hours from 12 noon to 2 pm. In Delhi, resident and junior doctors and medical students held a peaceful protest in front of the All India Institute of Medical Science Besides, protests were held across India and a large number of doctors and medical students held rallies in many districts. The Bill still remains “anti-poor, anti-federal, anti-democratic and lacks national character”, the IMA had alleged. IS IMA GREATER THAN GOVERNMENT, NITI AYOG, STANDING COMMITTEE AND OTHER HEALTH EXPERTS.